Whats up with the current weapon options for WPs in the Empire PDF? The single handed hammer is arguably more effective than the two handed one, and it lets you have a shield in addition to it. Is there a typo in the "Sigmarite Greathammer" statline? Am I missing something? Another subpar post by Ondjage. You are looking for some kind of balance in AoS? Well, the only thing giving the single warhammer an edge is the 4 attacks. They probably gave it that many to simplify the use of either one or two single handed warhammers. Strategy-wise I'd say use a hammer and shield or dual hammer priest as a frontline unit while the greathammer priest Is better for support. That +3 to wound and -1 rend would serve well as a flank attack after a imperial unit already charged in. Here's a picture I found on the total war site, the district lack of Sigmarines is interesting. There appears to be no restriction on shield & weapon use now. Am I missing something? Given the new AoS rules couldn't one take a warrior priest and claim both Greatweapon & shield? Or, is the weapon choice strictly based on what the model actually shows? (WYSIWYG). EDIT: It looks like the you follow the unit Description section to determine when (or if) a shield can be paired with a weapon. Got it now. The descriptions limit your options. In the case of a WP you cannot seemingly have both a great hammer and shield. That +3 to wound and -1 rend would serve well as a flank attack after a imperial unit already charged in. Haha, okay. Replace "flank attack" with "position where he won't get 3-4 enemy models swarming him". Anything to make the enemy get fewer attacks on him. I feel you, brother . . .
No, really, what's a flank attack? I'm the worst tactical commander in all of Westeros, after all. In the chance your being sarcastic/ironic/clever I'll answer that question and hope it isn't a joke that went right over my head. Flanking is the act of attacking the enemy's vulnerable side. To turn the flank means to hit the enemy formation/army at it's extreme left or right side where it's difficult for them to quickly bring up support to halt the attack. It's the military equivalent of a fist fight where one combatant is blind sided and struck with a hit he didn't see coming. Also, I've read GoTs but haven't watched the series so I'm guessing that's Stannis. He did alright in the books as far as I can remember. He just pulled some really cheap tricks with that vile sorceress. Hahaha, oh the irony of him burning a wax model of the fire priestess. My sister watches the series but didn't read the books so I knew what was going to happen before she did. She nearly killed me after seeing the red wedding and I never even hinted at what was going to happen. Seriously, she got onto me like I killed her best friend or something. Well, I do know that the books and the series are quite different. My sister pointed this out when I told her Greyjoy loses his pinky skin in the books but she said it was his um..."kraken sausage" that was hacked off. Aside from that there's far more love and action scenes in the series than the books have. This works very well for it's intended audiences as the books work for the readers who want more plot details and in-depth character knowledge. I don't watch the series as I have a personal portrayal of the characters in my mind and don't want them changed by the series characters. I'm also too cheap to buy HBO. Also, I totally saw the red wedding coming. The loud bands playing out of sync and the Starks seperated from their army while in a castle, a medieval deathtrap really, owned by the man who they basically gave the middle finger too just screamed trap. But on the other hand Charles Dance is excellent as Tywin, and i've heard Tyrion is better in the show. I don't know if it's told in the series but the books give a much darker detail to that fiend. Apparently the freak kidnaps nearby village girls and plays a game with them, if they can escape him, his hunting dogs and men he let's them return to their village. However, if caught, there's two outcomes. If they gave a good hunt he'll kill them then skin them, if they were poor sport he'll skin them then kill them. Then their remains are fed to his dogs. I blame the lords of that region really. If your neighbor has a skinned man for a flag and stories like that constantly come from that family's history and you do nothing about it that would be the warhammer equivalent of your neighbor putting corpses all over his battlements and piles of blood-drained bodies seen taken out of his domain. There's a point when you have to act. Anyway, Tyrion is my favorite character in the story. The part where he cast a shadow that showed him the height of any king was really telling of his character. Here's a good tribute to him. [Edit] haha, well, if those scenes are as good in the series as they were in the books I might have to let the moths out of my wallet. Haha, yes. We got way off topic. Sorry about that. 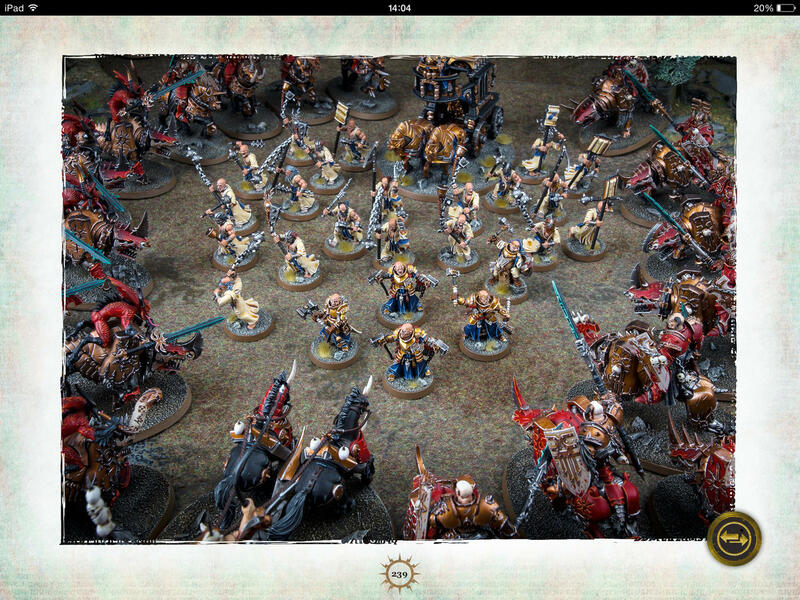 Haha, the repelling force of AoS against the attracting force of GoTs makes for a prominent shift. I was just making a joke about the show version of Stannis.